Today’s article is another one from Larry, the Keep It Simple Engineer, who gave us the four-part series on sourdough bread. 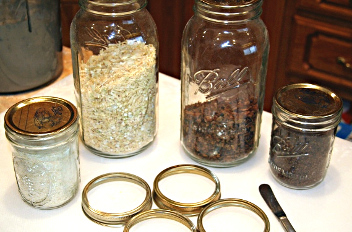 This time it’s a great technique for helping to stock the pantry. He’s doing it with onions, but I plan on doing this with a bunch of herbs this summer. 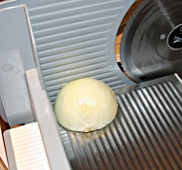 I love onions, gadgets, and baking bread. 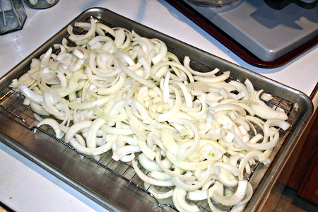 One of the tastiest breads I bake requires onions, and using dried onions is perfect for this. 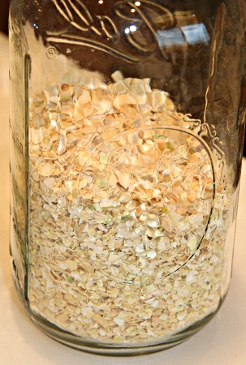 So here’s how I dehydrate onions to use for baking, and other things as well. I’m pretty detailed in my description, but you don’t have to do it just like I do — do it however you like, it might even be better than my way. 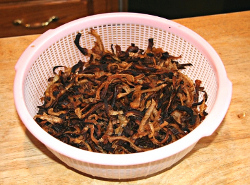 Dried onions can be added to soups and crock pot recipes. They can be added to rice cooker/steamers. They can also be reconstituted with dry vermouth or dry sherry or … ? 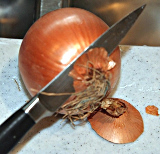 This dehydration method also produces onion powder, which can be used where the flavor is desired, but the texture of chopped onions is not. 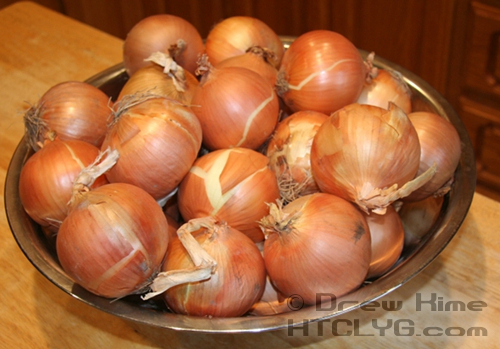 Roasted, dried onions have a much different flavor, aroma and more color. I will mix them with the non-roasted to get the desired flavor. This all may seem like a lot of work, and yes, it is. I also use this method for jalapeño peppers, and it’s much easier. I buy a large can of nacho-sliced peppers which are already conveniently sliced. Just rinse ’em, dehydrate ’em, and chop ’em. Purchase a bunch of onions. 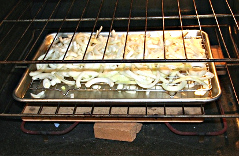 Roast part of the onions in the oven. 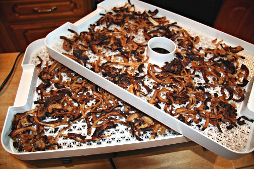 Put in dehydrator and dry. 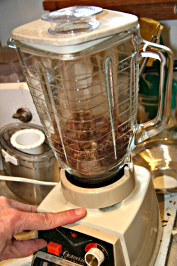 Chop up using food processor or blender. Separate and store for later use. 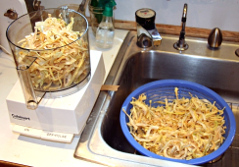 If I start early in the morning, the onions can dry overnight, then the next morning I can chop and store them. 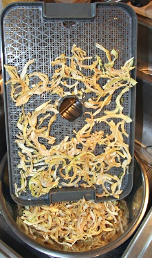 For dehydrating, I use L’Equip dehydrators . 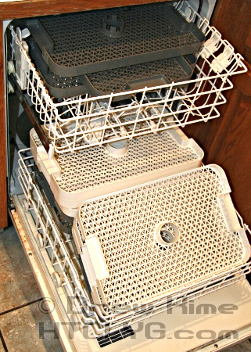 Although they come with six trays, L’Equip claims that up to twenty can be used. The first one I bought didn’t work out of the box, but Amazon immediately replaced it with another that has been reliable. 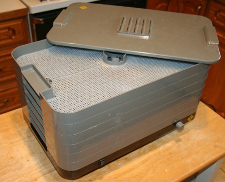 Wanting additional trays, but at over $25 a pair, I found a seller with open box, and got an entire second dehydrator for $85. 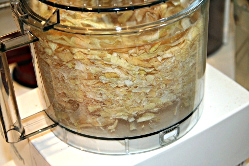 I have only used the L’Equip dehydrators, so I cannot compare them with any others. For slicing, I use an electric slicer. 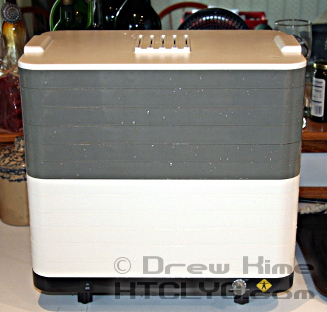 For years I wanted one but balked at spending $200-300 for what I envisioned I could use…but not very often. 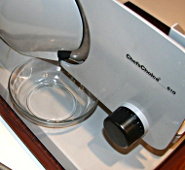 Then I bought a Chef’sChoice 610 for less than $100, it gets used everyday and works great. I have used a cheap, plastic mandolin for this. One or more fans (possibly optional, but not for me, I’m a crybaby). For roasting, I just use aluminum baking pans and baker’s cooling racks. 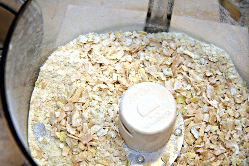 For chopping I use a blender and also a food processor. 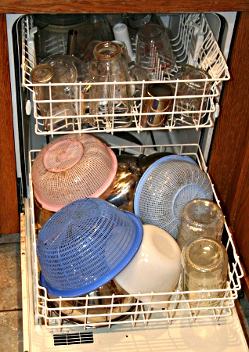 For separating, I use plastic strainer baskets found at Asian markets. One of my grandmothers was raised on a farm and dairy. She cooked up a storm, and would have been tickled pink to have all these gadgets. I’ve seen onions as low as 15Â¢/pound, generally 25Â¢ is what I pay. After dehydration, you can expect a 90% reduction in weight. 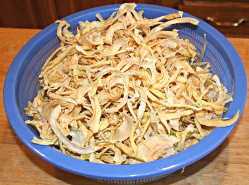 Eight pounds of onions after being dried and chopped will fill a quart jar. When selecting onions, look for symmetrical shape, no discoloration under the skin, and no softness at the stem end. I use yellow onions, which seem to be preferable for cooking. All this work for less than three dollars worth of onions. Worth it? Ask me as I’m eating a grilled cheese sandwich on sourdough onion bread. This is my slicing station. 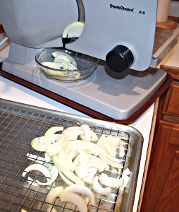 Onions to the left, slicer to the right, plastic strainer to keep onions skins out of disposal, cutting board and knife. One fan in window and another (not shown) breezin’ it from the left. We are talking onions here. 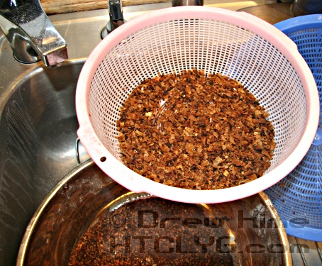 I use the mesh liners for the L’Equip dehydrator. 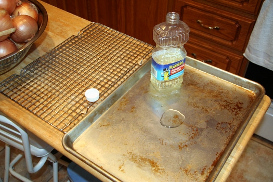 I also coat the inside of the baking pan with a little peanut oil which helps in cleanup. Also, preheat the oven to 190° C / 375° F / Gas Mark 5. 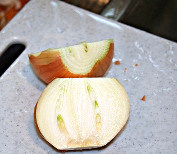 Peeling and slicing 10# or more onions is no small feat, here’s how I made it relatively easy. First slice off the stem end as shown. 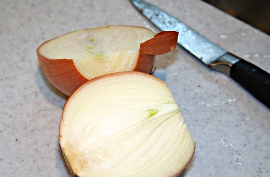 Then slice off the root end, leaving the core of the root end which will hold the onion together. 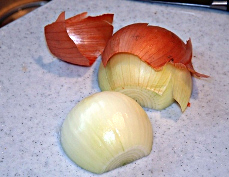 Then slice the onion in half, going from root end to stem end. 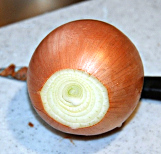 Best results will happen if the splitting slice follows the center core of the onion. I place the onion root end up after aligning the stem end core with a mark”•I use an imaginary line from the sink edge under the cutting board. Now the outer skin can be removed easily, it may even leap off by itself. This “before the peel” slicing makes a dramatic difference in the work involved. You might even say it’s truly appealing, but I won’t. Be careful, use the holder avoid mis-steak-fingers! Slice and arrange the pieces on the cooling rack in the baking pan. Shoot for uniform depth perhaps slightly shallower in the center. Into the oven, preheated to 190° C / 375° F / Gas Mark 5. (I use a pizza stone and firebrick pieces in the oven’s bottom, helps stabilize temperatures.) Repeat for the second tray. 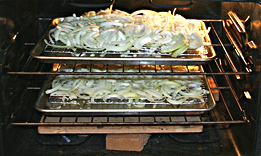 Every half half hour or so, check the onions’ progress and switch upper and lower trays. The amount of time required is somewhat long as a lot of the moisture in the onions is being “cooked out” in the roasting of the onions. Be prepared for a terrific aroma. The onions are done when they look like this. It may take several hours. You will see the steam coming off the onions and out the ovens vent. 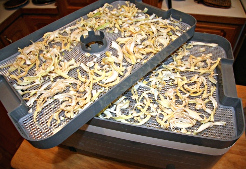 While the onions are roasting and causing intense cravings for hamburgers, finish slicing the onions and placing them on the dehydrator trays. Now the roasted ones. A splatulata (a big spatula) will help getting the roasted onions off. 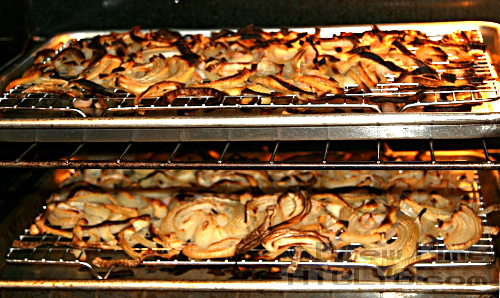 I put the dehydrators in the garage, so the entire neighborhood will be hungry by supper-time. Generally if started by noon, they’ll be dry the next morning. Follow the dehydrator manufacturer’s directions. 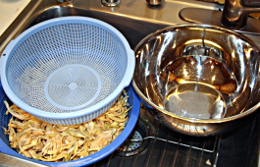 When the onions are dry, move them into the plastic strainers. Here the smaller pink one has larger sieve holes than the larger blue strainer. The roasted onions will be coarser that the plain ones. 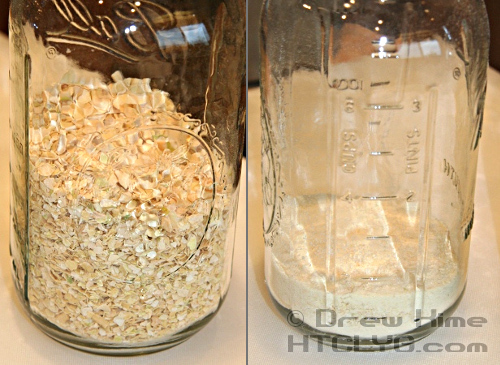 I chop in the food processor, although a blender works just as well, just not as much at a time. 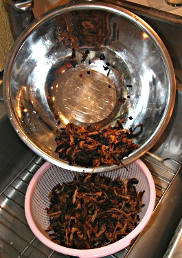 The chopped pieces will be sorted out by the light blue Asian plastic strainer into chopped and powdered. The food processor is briefly pulsed until the onions are chopped”•and there will be a bit of powder, too. Here the “magic” flash catches the onions in mid pulse. 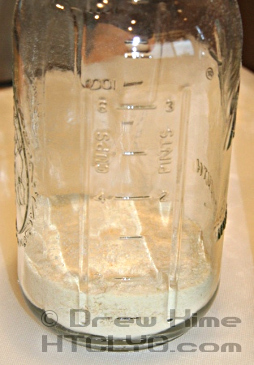 Dump the chopped onions and powder into the strainer/sieve, shake gently over the bowl, then pour the chopped onions in one mason jar, and the powder in another. The roasted onions do better in the blender, but I start them off in the processor (since it’s already onionized), then move to the blender. 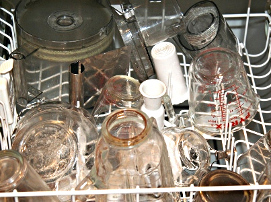 Most utensils go in the dishwasher. The baking pans clean easily when soaked with hot water. 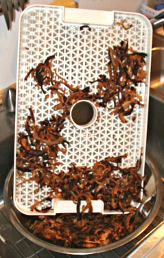 The L’Equip dehydrator trays also will go in the dishwasher, but use the short, no-heat dry cycle. 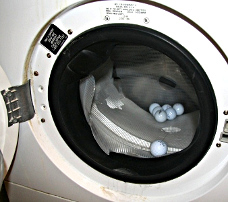 The L’Equip tray meshes will go in my front loading washer”•just a little soap and bleach with some golf balls (sounds like you’re living next to a bowling alley). And guess how you dry the L’Equip dehydrator? Camera: Canon EOS Rebel XT with EFS 17-85mm Macro-zoom. Larry wants to thank Bernie for all her help with the write-up.